The idea was straightforward: to document the biographical information put out by and about the candidates who hoped to become president. The project proved amazingly successful. Today, the campaign biography collection encompasses campaigns from Andrew Jackson’s defeat of John Quincy Adams in 1828 through the historic election of 2012. 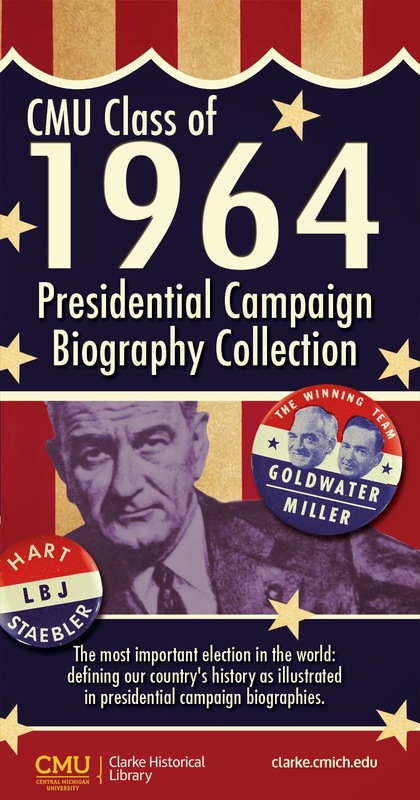 Soon enough, the Clarke Historical Library will begin buying the books issued for the 2016 race -- the cheerful biographies “favored” by the candidates, the alleged “smears” published by their critics, and of course the books authored by the candidates themselves in which they portray their vision for America. All of these books help us understand the candidates the public voted for (or against). It makes it possible for future students and scholars to study the reason, and the emotion, behind the selection of the president. 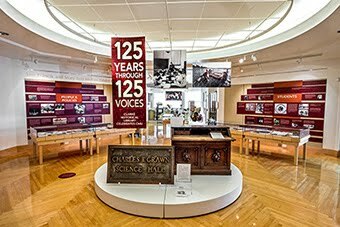 And it allows the library to mount an exhibit about the presidential election every four years, which helps the CMU community understand the current presidential contest through a meaningful historical filter. Overall, it is a truly valuable collection that we are proud to preserve, and regularly enlarge. Although the collection continues to grow, the original financial gift from the Class of ’64 was long ago spent. This year, at the 50th reunion of the Class of ’64, we asked them to help us create an endowment to permanently support the project they so generously helped us begin a half-century ago. While the collection was created by the Class of ’64, and thus we hope they have a special interest in helping to forward it, interest in the presidency and those who would aspire to that office certainly extends far beyond that one Class. Thus, we welcome support for the Endowment campaign not only from members of the Class of ’64 but from anyone interested in helping us continue the documentary effort they established. Our goal is to raise $10,000, an endowment of sufficient size to create a spendable fund that will pay for the biographical books and other related material generated every four years, when the country is called upon to select its leader, as well as to establish funding to “fill in” missing works in the collection. I hope that if you have an interest in this project, and in the Clarke, you will consider a year-end gift to the Class of ’64 Presidential Campaign Biography Endowment. Please click on this link for details about taking advantage of this opportunity. Until 1954, November 11th was recognized in the United States as Armistice Day, marking the anniversary of the end of the First World War. Sixty years ago, Americans decided to expand the scope of the day to honor all veterans of the military as part of a Veterans Day. But across Europe, November 11th holds a special place to remember the bloody, world-changing event that was supposed to be “the war that will end war.” In November of 1918, when the War was coming to end, reflecting upon the horrors of the War was not what people were doing to mark the end of combat, they were celebrating. 4,000 miles from the front, in Mount Pleasant, Michigan, the end of the War brought about celebrations, just like in cities across the country. The November 8, 1918 Isabella County Enterprise (p. 4, col. 2) reported that “the Liberty Band appeared on the streets and played a 'Hot Time' on all the down town streets. A platform was built on the corner of Main and Broadway, and in the evening a regular old-fashioned jollification was held. 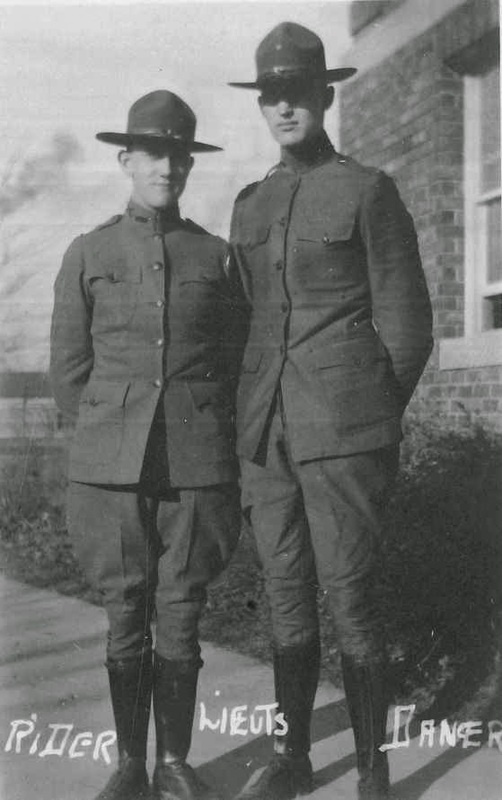 There was lots of music, red hot speeches, and everybody rejoiced.” There was only one problem – On November 7, incorrect reports of the signing of an armistice spread across the United States and the victory celebrations were four days too soon. While many Americans here at home prematurely popped the corks on the celebratory champagne*, the War raged on another four days. Casualties continued to mount until just moments before 11:00 am, November 11, the time when the armistice took effect. Word that the armistice was truly agreed to quickly spread across the Atlantic. When the news hit American shores, the celebrations began for a second time. 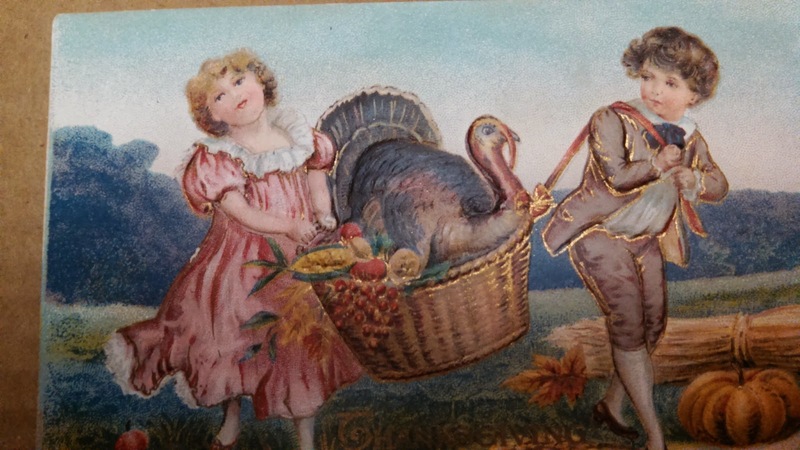 As the Isabella County Enterprise of November 15 (p. 1, col. 2) noted, “Monday [November 11] the real thing happened and again the town [Mount Pleasant] went wild.” The hearty souls in Mount Pleasant had it in them to celebrate two times in four days. The second celebration was turned into an event that went on for multiple days. Wednesday, November 13, an ox roast was held and “not hundreds – but everybody – came to the barbecue.” The students from Central, including those in the Student Army Training Corps (SATC), joined in a parade with many other citizens and groups from Isabella County. The parade wound through Mount Pleasant to Island Park, where a band played and whoops and hollers filled the air. Professor Pearce gave a speech followed by the testimony of Howard Petoskey, who served in the Second Battle of the Marne. 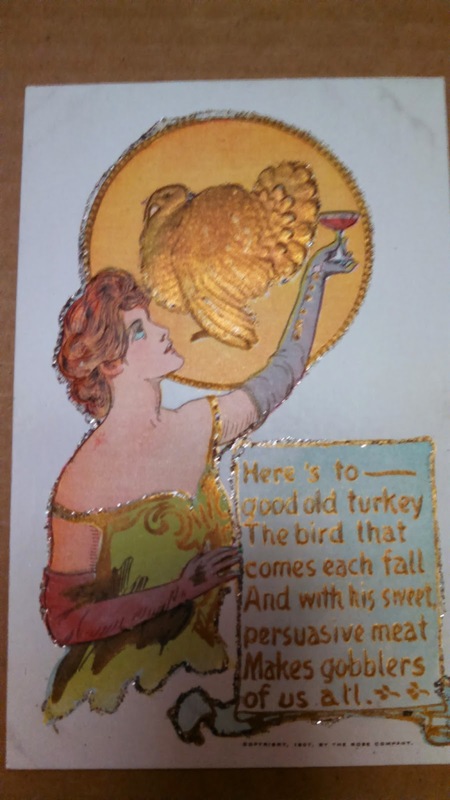 *The champagne flowing in Mount Pleasant could have been sparkling grape juice considering that Michigan had enacted prohibition beginning May 1, 1917. 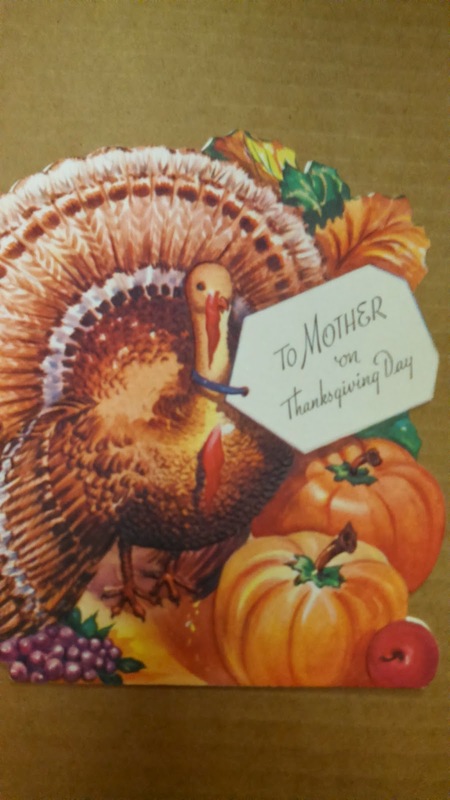 On November 3, the last of six programs sponsored this fall by the Clarke Historical Library was held. The speakers offered their audiences a great deal of information on a wide range of topics. The Clarke’s current exhibit, Photography: Process, People & Preservation, was opened on September 18 with a lecture about pre-digital photography by CMU Professor Al Wildey. Professor Wildey, who also generously loaned cameras from his personal collection for our exhibit, highlighted a variety of photographic processes used through time, noting how each played a role in the development of photography. 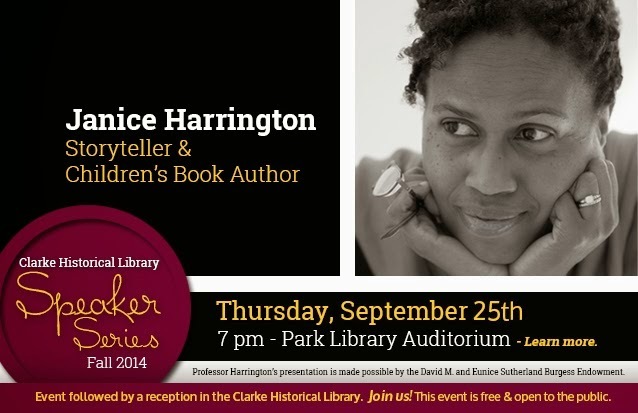 On September 25, Janice Harrington demonstrated why she has performed at the National Story Telling Festival in Washington, DC, as she enthralled her audience with story, personal narrative, and an impromptu poetry reading. She discussed where she drew inspiration for her children’s books and the process through which an idea eventually became a book. The poetry reading came about when Professor Harrington met the founder of the David M. and Eunice Sutherland Burgess Endowment, which made the evening’s event possible. Ms. Burgess expressed her admiration for Professor Harrington’s poetry. Although it wasn’t planned, the evening ended with a Harrington reading a few poems, among them one of Ms. Burgess’ favorites. On October 1, the focus shifted to barns as Steve Stier, one of the state’s leading experts on the subject, presented an illustrated lecture describing Michigan barns. A basic introduction to barn architecture and styles flowed seamlessly into a discussion of the people who built Michigan’s barns. The photos reminded the audience of the poses, none of them likely to meet contemporary OSHA standards for construction safety, local boys and men often assumed high up on the barn rafters, when a photographer came calling. On October 14, Professor Andrew Mahon took the audience on a research trip to Antarctica. The stories of serious research were mixed with photographs of the awe and wonder found amid the continent’s unending ice, and what life aboard a research vessel was really like. 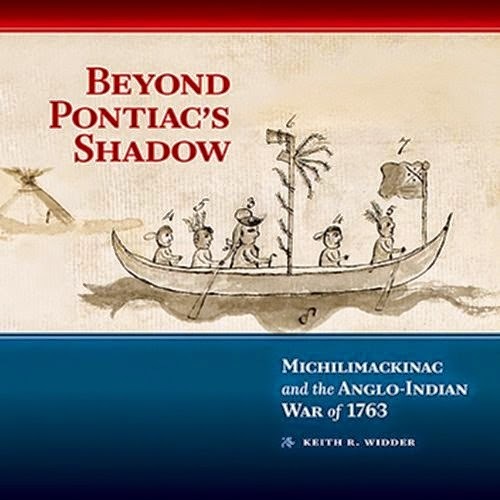 On October 23, author Keith Widder opened a fascinating window on the capture of Fort Michilimackinac by Ojibwe warriors on June 2, 1763. The story commonly told ends with the capture of the Fort, but Mr. Widder’s story only began on June 2. He told a fascinating and complex tale of diplomacy involving Britain and several Native American nations. The capture of the Fort by the Ojibwe did not have the support of all of the Native American tribes in the region, and some tribes, including some bands of Ojibwe, were distinctly displeased with the attackers. Eventually the British soldiers who were taken captive after the fighting ended were returned to Montreal, but they traveled in a most peculiar convoy that mixed imprisoned British soldiers with other British redcoats from Green Bay traveling freely back to Montreal with their Menominee and Odawa tribal allies. 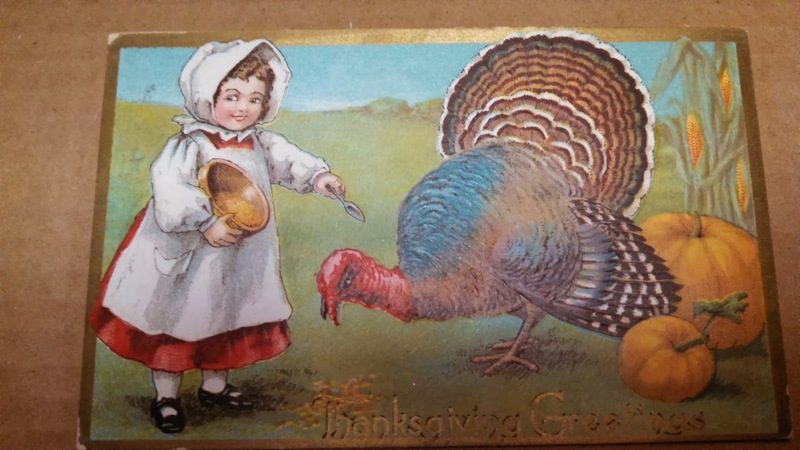 Finally, on November 3, Michigan State University librarian Michael Unsworth discussed the underutilized but extremely valuable Michigan Pioneer and Historical Collections. A forty volume set of pioneer reminisces, historical sketches, original documents, and the occasional “historical paper,” the long-running series offers a true insight into early life in Michigan. It does not necessarily give up its secrets easily; the multi-volume set was actually published under three different titles and finding online a single, searchable set of the volumes takes more than a bit of persistence and skill. Stay tuned to the Clarke's News and Notes blog for more information about our upcoming spring speaker series, which promises to be informative and captivating.